I have been dying to try the tequila cocktails at Calavera. They plain sound amazing, and it’s hard to go wrong with me, tequila, and something spicy. 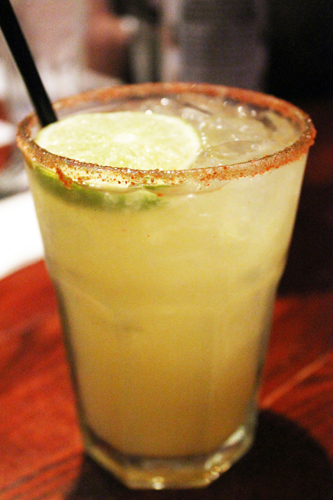 So ordering the cilantro jalapeno margarita was basically a foregone conclusion. I’ve tried a million varieties on it by this point. Or, you know, four. Made with Jimador tequila, lime, orange juice, and a cilantro and jalapeno simple syrup, this drink is satisfying if not quite as finessed as it could be. It reaches “Very!” on my unofficial spice scale running from “Peppers? What peppers?” to “Need a glass of milk, STAT!” The savory elements on the rim are essential to the drink. Otherwise, the sugar from the syrup would be overwhelming. The sour mix of just orange and lime is a nice complement to the rest of the drink, but I prefer it when a drink using fresh ingredients has some flecks of those ingredients in it. Somehow, that soothes me more.